Few cruising grounds in the world can match British Columbia’s coastline for stunning scenery: majestic fjords, half-hidden inlets, and hundreds of islands. And to complete this perfect picture, a temperate climate! 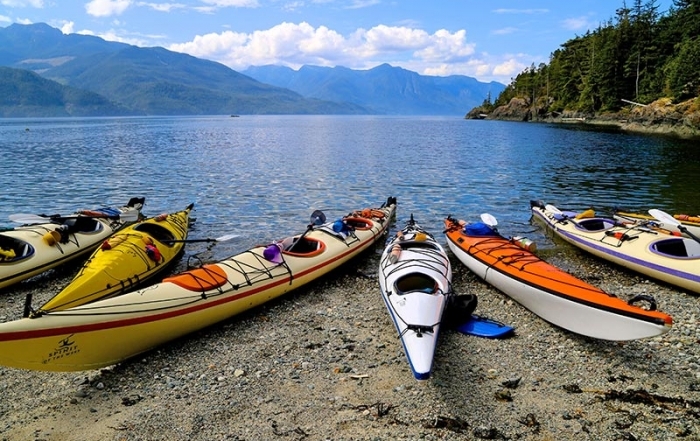 Offshore, boaters can explore the sheltered waterways and the popular marine parks around Vancouver Island or nestled amongst the Gulf Islands – a dazzling playground for kayakers and pleasure boats, both large and small. Government wharves, safe anchorages and quaint coves all contribute to memorable boating vacations. Captain your own ship or join a skippered charter as you share our calm, clear waters with porpoises, whales and swooping eagles. 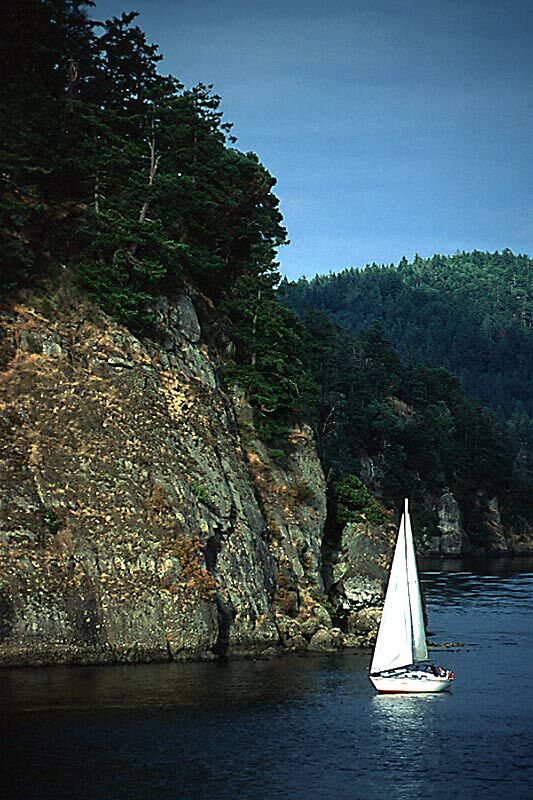 The coastal waters around Vancouver Island, and the Marine Provincial parks that dot the BC coastline, offer recreational boaters great places to anchor for a few hours, or overnight. These marine parks provide essential facilities for boaters while maintaining the natural surroundings of the area. Port Hardy is located at the northern tip of Vancouver Island, and serves as the gateway to some truly wilderness cruising grounds, while also the southern terminus of the BC Ferries’ Inside Passage and Discovery Coast routes. Port hardy has excellent marina and moorage facilities, and long-term parking for RV’s and vehicles. Telegraph Cove is one of the last boardwalk communities on eastern Vancouver Island and definitely worth a visit. 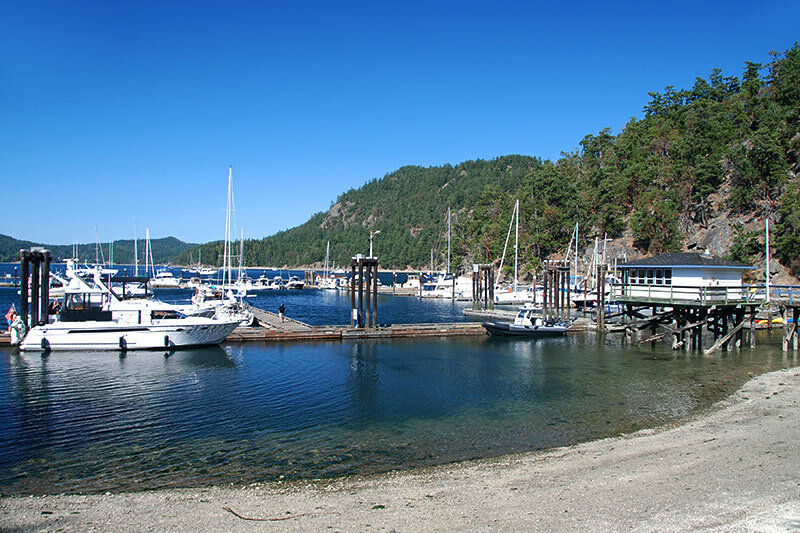 Telegraph Cove offers a boat launch and moorage, fishing licences, tackle and bait, and is the place to begin exploring Johnstone Strait and Robson Bight. Long-term parking can be arranged here for those setting out on extended boating trips in Johnstone Strait. Broughton Archipelago Marine Provincial Park offshore from Telegraph Cove is a wilderness area consisting of a maze of several small islands, numerous islets and adjacent foreshore at the southern extremity of Queen Charlotte Strait. Good, safe, all-weather anchorages can be found at Waddington Bay, Farewell Harbour on Berry Island, Joe Cove on Eden Island, and the cove on the southeast side of Crease Island. From Parksville or Qualicum Beach, cruise across the Strait of Georgia to Jedediah Island Marine Provincial Park or to nearby Lasqueti Island, which attracts boaters each summer to its sheltered coves and bays. Comox is a good base from which to charter boats to prime cruising areas … the Discovery Islands, Tribune Bay, Princess Louisa Inlet or Desolation Sound. 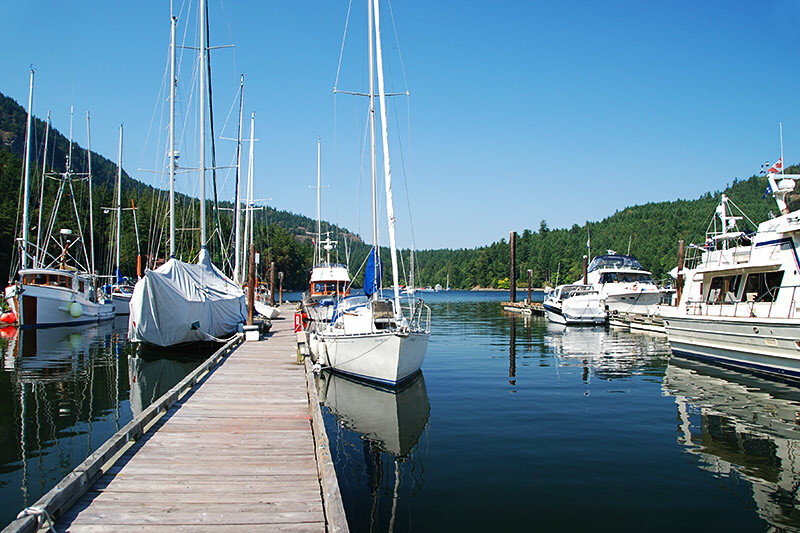 Most yachtsmen regard the Desolation Sound area as the most beautiful cruising ground in British Columbia, and one of the premier sailing playgrounds in the world. The sixty miles of breathtaking coastline, intricate waterways, small islands and numerous attractive bays and coves will delight even the most demanding of adventurers. Campbell River is the gateway to the Discovery Islands, located between Vancouver Island and the BC mainland. The islands form a picturesque and pristine archipelago that attracts boaters every year. One must take time to explore these islands, many of which are situated in marine parks, as each has its own history, distinctive charm, culture and colourful characters. Boat launches are situated at two locations on slender, steep-sided Buttle Lake in Strathcona Provincial Park. One is located beside the Auger Point picnic tables in the Buttle Lake Campground; the other is located about 15 miles (25 km) south of the campground near the Karst Creek picnic area. Note: Buttle is a flooded lake, and along the shoreline submerged deadheads are an ever-present threat. Beware of the sudden winds and storm conditions that can quickly channel through this mountainous region. Boaters can head to four wilderness marine campsites on the western shore of Buttle Lake, as well as a site on Rainbow Island just offshore from the Buttle Lake campground at the north end of the lake. 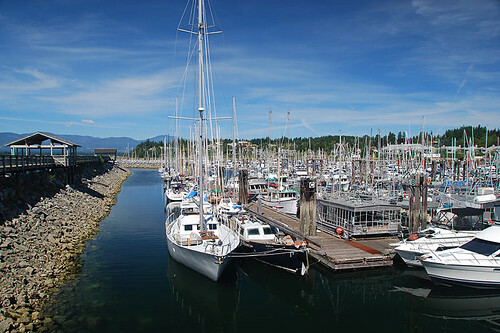 Known as the Harbour City, Nanaimo is second only to Victoria as Vancouver Island’s largest and most vibrant city – famous for its varied landscapes. This city possesses a great waterfront, and many boaters find Nanaimo to be the ideal centre for exploring the Gulf Islands to the south, or Desolation Sound to the north. There’s a public boat ramp at Pipers Lagoon Regional Park. It’s one thing to putt-putt around the sheltered lagoon, but quite another to brave the open water of Horswell Channel on the east side of the narrow headland that shelters the lagoon. There is a municipal boat launch in the centre of Ladysmith, the place to begin exploring the 5-mile (8-km) length of Ladysmith Harbour. Dunsmuir and Woods Islands on the north side of the harbour are good destinations in summer. Sidney is a picturesque town that combines the charm of a small port, first class marinas and the rustic character of a farming community. 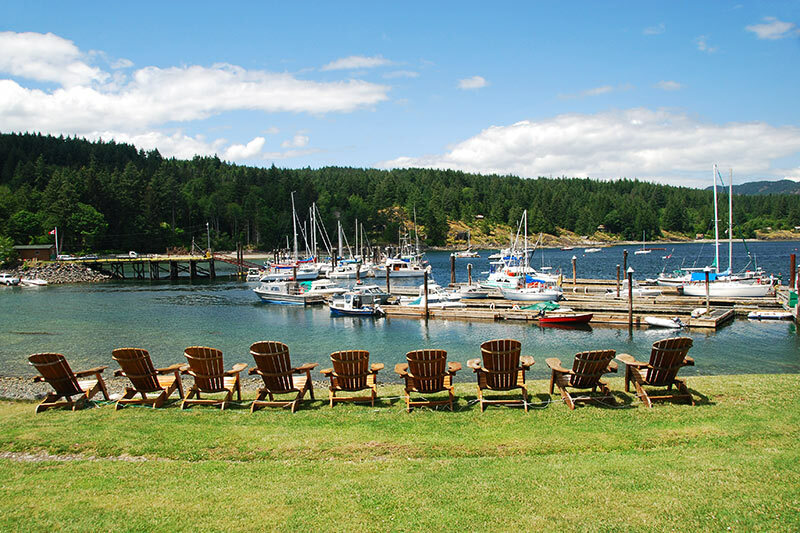 Sidney is the gateway to the enchanting Gulf Islands, and is an ideal spot for cruisers, whether passing through or just taking a day trip. Launch from either the boat ramp or wharf in Sidney and head across the channel to Sidney Spit on Sidney Island or Princess Margaret Island, both of which are incorporated into Gulf Islands National Park Reserve. To locate the launch, drive to the east end of Beacon Avenue. James Island shelters the waters of Cordova Channel in front of Island View Beach Regional Park. A boat ramp is conveniently located at the entrance to View Beach Regional Park. A public boat launch is located beside the federal dock at the north end of Lands End Road at Swartz Bay. This is a good place to put your boat in the water and head for any number of nearby islands or to explore the coastline of the Saanich Peninsula. Those in small craft should be cautious of the wash from BC Ferries’ boats and larger marine traffic around Swartz Bay. Sooke Harbour is separated from the Strait of Juan de Fuca by Whiffen Spit – the sheltered waters are ideal for a leisurely cruise. The rugged and remote west coast of Vancouver island features six main inlets and sounds, listed from south to north: Quatsino Sound, Kyuquot Sound, Esperanza Inlet, Nootka Sound, Clayoquot Sound, and Barkley Sound. This coastline is known for it’s ocean swells, superb outer reef systems, and long expanses of pristine and deserted beaches. Marine wildlife in the area includes killer whales (Orca), migrating gray whales, seals, porpoises and sea otters. Many visitors to the west side of Vancouver Island may never have the chance to boat in the wind, the rain, and the ever-rolling seas that characterize the world of the “outside” waters, as the open ocean here is often called. However, the opportunity exists to do this, aboard the freighter MV Uchuck III, which plies the waters between Gold River, Tahsis, Nootka Sound and Kyuquot Sound. These exciting journeys present unparalleled views of the rugged and remote wilderness beauty that is the west coast of beautiful Vancouver Island. Quatsino Sound on the northwest coast of Vancouver Island is a huge sound that leads in from the Pacific Ocean, almost separating the northern tip of the island from the rest of Vancouver Island. 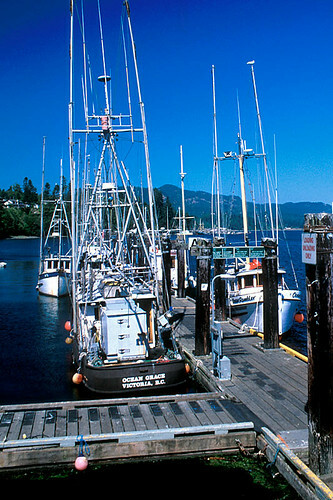 Situated on or near Quatsino Sound are the small communities of Winter Harbour, Quatsino, Coal Harbour and Port Alice. Kyuquot Sound is a wilderness area, except for a number of logging camps and the village of Kyuquot, the northernmost of the 14 Nuu-chah-nulth First Nation bands. Kyuquot with its homes built into the forest above the tideline is a welcome sight for boaters turn into a small bay and find civilization after rocking and roiling for several hours in the open waters of the Pacific Ocean. The rugged and remote Esperanza Inlet and Nuchatlitz Inlet are accessed by boat from the nearest towns of Tahsis and Zeballos. Nootka Sound is steeped in history and surrounded by the natural beauty of the west coast of Vancouver Island. 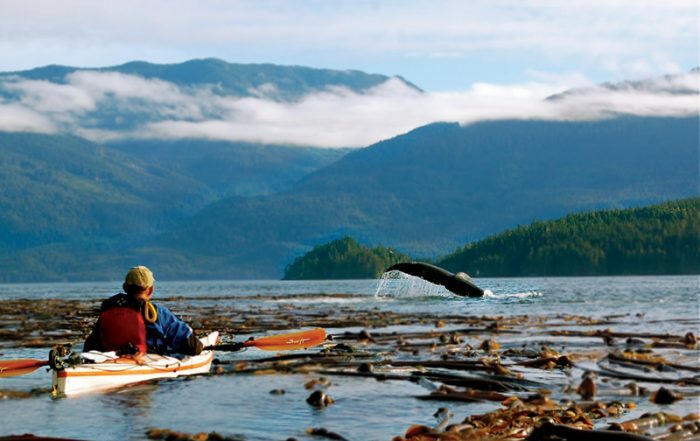 Nootka Sound is a paradise for sport anglers and outdoor adventurers seeking to explore and enjoy the magnificent wilderness surroundings and weather-beaten landscape. The community of Tahsis sits at the head at the head of Tahsis Inlet, a deep fjord that cuts northwards off Nootka Sound. Tahsis offers complete facilities for boaters and sport angles, including moorage marine supplies, boating and fishing gear, fishing licences and bait, fuel, ice, showers, laundromat, and restaurants. Road access is available from Tahsis to the east coast of Vancouver Island. Located in Nootka Sound is the birthplace of British Columbia; the small community of Yuquot, also known as Friendly Cove. Historical Friendly Cove was the site of the first contact between Europeans and First Nations people in British Columbia. The sheltered waters of Muchalat Inlet run inland from Nootka Sound like a long corridor through steep-sided fjords to the terminal south of Gold River. Bligh Island Marine Provincial Park (part of the Spanish Pilot Group) sits at the mouth of Muchalat Inlet. There’s much to explore in this group of six islands, scattered where Muchalat Inlet converges with two adjacent inlets and their channels. The waters in this region can get choppy, so small craft must cross with care. Large Bligh Island is named for a much-maligned British Navy captain who sailed here with the equally well-known Captain Cook in 1788. A cairn at Resolute Cove near the small community of Yuquot commemorates the landing. North of Barkley Sound is Clayoquot Sound and the community of Tofino. Boating in the waters of Clayoquot Sound is one of the most rewarding ways to experience this environment. Day trips close to Tofino include Meares, Stubbs, Wickaninnish, and Vargas Islands, all within sight of the federal dock in Tofino. Farther afield is Flores Island. 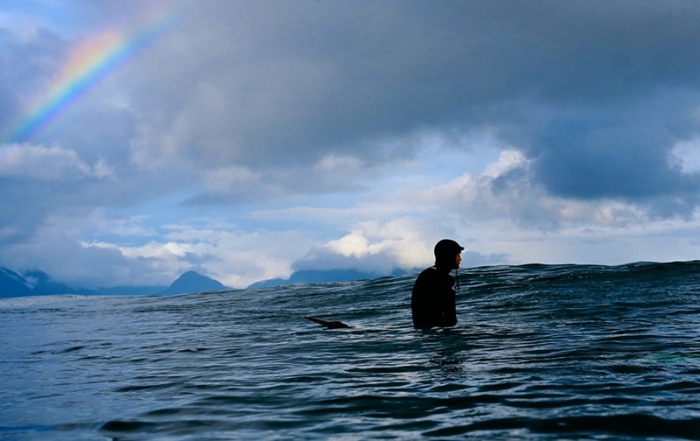 The sandy beach on Stubbs Island makes it an ideal getaway within sight of Tofino. You can land on the east coast of Vargas Island, 3 miles (5 km) north of Tofino, and make the one-hour journey across island on foot to Ahous Beach. If you boat to Ahous rather than hike, be prepared for a stretch of open ocean as you round the exposed southwest corner of Vargas. If it’s blowing too hard, check out isolated and delightful Medallion Bay on the south end of the island. Nothing on Vargas, however, tops Ahous Beach’s lengthy expanse, which rivals Long Beach in size. So vast is its hard-caked, sandy surface that light planes occasionally land here. Boating in the waters off Clayoquot Sound is spectacular. Take a side trip to Maquinna Provincial Park, accessible only by boat or floatplane. From here, a pleasant half-hour stroll through lush, dense old-growth rain forest leads to Hot Springs Cove and it’s series of enticing natural rock pools -perfect for a rejuvenating soak! 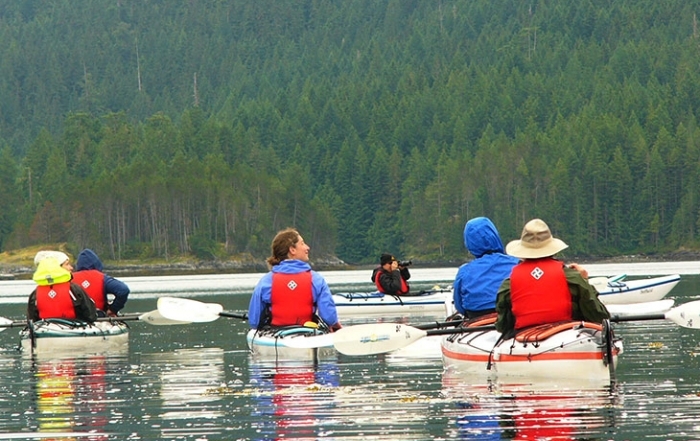 Grice Bay is a sheltered niche of ocean waterway tucked in beside Meares Island in the backwater of Clayoquot Sound. At low tide, the bay drains so low that it takes on the appearance of a green marshland. Eelgrass covers much of the mudflats in Browning Pass, which links Grice Bay with Tofino to the north. A boat launch is located at the end of Grice Bay Road, which leads east from Highway 4, almost 9 miles (14 km) south of Tofino. 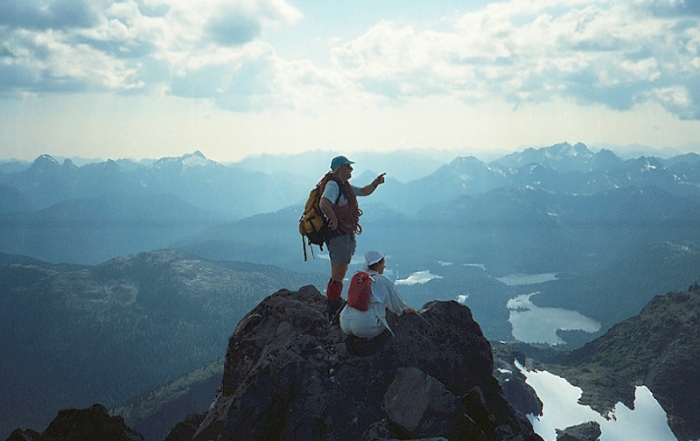 Grice Bay lies within the northern limits of the Long Beach Unit of Pacific Rim National Park. As intimidating as the ocean can be at Long Beach, there are wonderfully long, calm days in summer when boaters and paddlers can safely enjoy an excursion offshore. A boat launch is located beside the parking lot at the north end of Long Beach beside Hwy 4. Barkley Sound and the Broken Group Islands comprise one of the three main recreational components in Pacific Rim National Park, and is not as exposed as the other sounds. The popularity of these islands with paddlers and boaters has soared over the past decade, as they provide a true west coast experience in sheltered water. Barkley Sound is not normally subject to the extreme ocean conditions farther west in the open waters around Ucluelet and exposed sections of the West Coast Trail and the Long Beach Unit, the two other areas that attract visitors to Pacific Rim National Park. Sprinkled throughout Barkley Sound are the Broken Group Islands – over 100 of them – an intriguing archipelago forming an intricate network of waterways. Boaters can explore sheltered coves and uninhabited islands. The exquisite scenery, rugged coastline and white sand beaches beckon to be explored – cruising among the Islands will foster unforgettable memories. 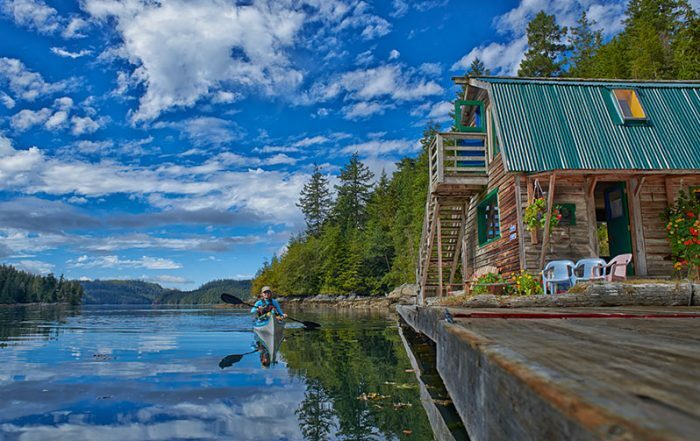 Ucluelet and Bamfield are the two main communities on Barkley Sound, both of wish are commercial fishing villages and popular tourist destinations. Some of the more popular and easier-to-reach parks in the Southern Gulf Islands include Montague Harbour Marine Provincial Park and Dionisio Provincial Park on Galiano Island, and Beaumont Marine Park on the Pender Islands, as well as Winter Cove Marine Park on Saturna Island . Other marine parks include Cabbage Island, off the northeast coast of Tumbo Island east of Winter Cove Marine Park, and the large Princess Margaret Marine Park on Portland Island between Saltspring Island and the Pender Islands. In the Discovery Islands, Jedediah Island, which nearby Lasqueti Island residents refer to jokingly as Club Jed, stands apart from other Gulf Islands because of its size (about 600 acres/240 hectares) – one of the largest island parks in the province – and the fact that visitors are free to camp anywhere on Jedediah. Some of the best sites are near the shoreline around Long Bay, particularly as the drumming sounds of diesel-driven marine traffic in Sabine Channel don’t reach this side of the island. Most island parks are intended as way stations and provide sheltered anchorage for those travelling in liveaboard boats. Home Bay is semi-sheltered by Mother Goose Island, which lies just offshore, but it lacks the tranquillity of Long Bay. Both bays teem with shellfish: when the tide goes out, the exposed mudflats are ripe for clam raking. For those who journey past the south end of Lasqueti Island, there’s good reason for putting ashore at Squitty Bay Marine Provincial Park. Not only is there freshwater from a pump in the park’s picnic area, there’s also an interesting adjacent ecological reserve, and great views of Vancouver, distant Mount Baker in Washington, and the white expanse of the Comox Glacier in the Comox Valley. Sandy Island Marine Provincial Park is located so close to the north end of Denman Island that at low tide you can wade to the park from the tip of Longbeak Point. These islands are a holdover from a distant time when the entire Strait of Georgia was filled with sand. In more recent geological times, glaciation gouged out the trench that is now filled with seawater. Octopus Islands Marine Provincial Park is both remote and accessible at the same time. Nestled among the maze of islands through which the waters of Johnstone Strait funnel into the Strait of Georgia, the Octopus Islands are most easily reached from Quadra Island. Tidal currents around Quadra Island are notorious for their strength, particularly at Surge Narrows on the east and Seymour Narrows on the west, which should be transitted at slack tide. Boaters should be well versed in the reading of tidal-current charts to safely explore the fascinating waters around tightly packed Quadra, Cortes, Maurelle, Read, and Sonora Islands. Summer is flat – great for power boating or running the motor to charge the batteries! Van Isle 360 Degree International Yacht Race. 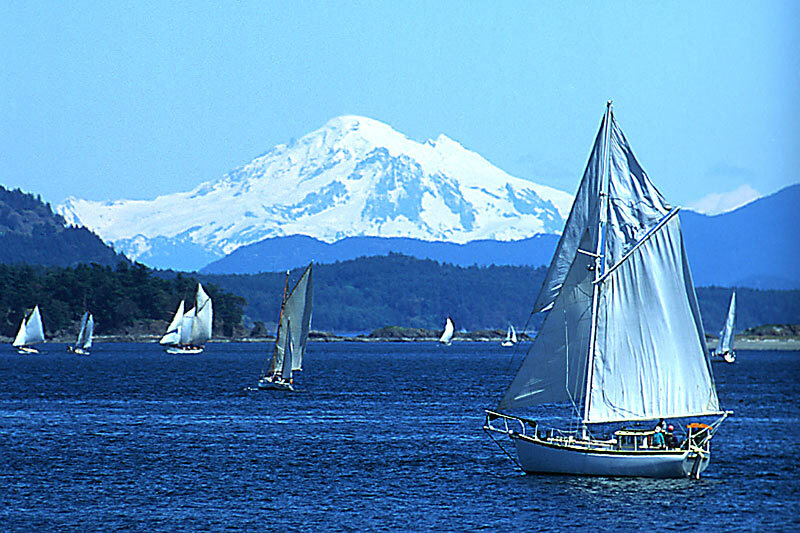 A sailing race of 580 nautical miles circumnavigating wild and rugged Vancouver Island. Swiftsure International Yacht Race. A sailing weekend held in Victoria in May, hosted by the Royal Victoria Yacht Club.